You're celebrating a great couple that's been together through thick and thin for fifty years! Perhaps you need the perfect favor for that special 50th birthday. 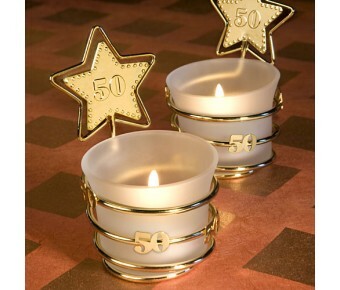 So give them and your guests the star treatment with these glitzy golden anniversary keepsakes. 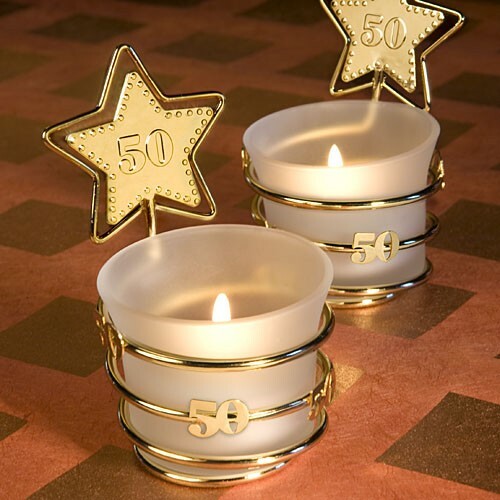 Sold only by Fashioncraft, each Fabulous Fifty favor measures 3.5" x 2.25" and has a frosted white glass candle holder with a white tea light candle inside resting in a gold metal coiled wire base. The base's coil wraps around the holder with "50" enhancements and rises up to form a star shape with a beaded star design "50" charm at its center. Sure to leave your guests starry eyed, each comes individually packaged in a white box.